Norman Brown is another of the newer talents I like to spend a little time with. Quick, smooth and precise, Norman is easy to listen to while reading, driving, cooking, partying, a whole range of activities. Brown does all of his own arrangements and creates some great combinations of talent and instruments. 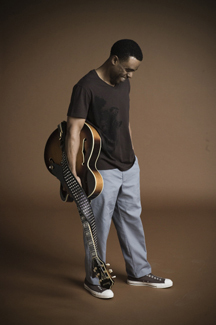 His 2008 album After the Storm was Jazz Album of the Year on at least two charts. It is one of my favorites and it features a great version of That’s the Way Loves Goes, a composition by James Harris, Terry Lewis and Janet Jackson. Brown is probably best recognized for his version of Ernie Isely’s For the Love of You, which gets tons of play on all smooth jazz radio stations and live streams. I also really enjoy Norman’s Just Between Us CD. Do I like Jazz & Big Band? Not so much in its original form. I enjoy watching an old clip of a nattily tailored band playing to elegant dancers in a sleek Art Deco ballroom, caught on some classic movie on TCM. It truly was a time — but not the only time — when popular music achieved excellence, and excellence found an audience. That said, I don’t listen to any classic Big Band, at all. Imagine my surprise, therefore, about a year ago when I dropped by a humble tavern in my neighborhood that had started booking jazz. I stepped inside and found myself face-to-face with an 11-piece Big Band in full thunder. What I took for the front door turned out o be a side door, so I was literally fronting the band, a yard in front of the rhythm section. If there had been a mike and a song I knew, I might have tried to sing it– the experience was that immediate and involving. Instead, I found a seat among a crowd that barely outnumbered the players. It was bigger the next week, though. I probably spent five hours in there, coming back with my little family, and again as the cast of players shifted from week to week. They always were some of Denver’s best players, many of them are teachers at a local college’s jazz program. I realized I”d been hearing their names on the local jazz radio station (one of the few 24-hour jazz spots on any dial). We’ve quietly been developing a cadre of notables, most notably trumpeter Ron Miles. Bill Frisell, who knocks me out with his Hendrix-influenced Americana, was a Denver native who comes by often. How was the music? Oh, the music. Melodic, dynamic, intensely emotional. Cheerful, in a way jazz often isn’t, but that’s in tune with the bandleader’s debut title, “Unfailing Kindness.” The composer and conductor was Chie Imazumi, a Berklee grad who’s set up shop in Denver for now. She paints with the usual big-band’s broad palette of instruments, along with a prominent lead guitarist who sometimes cranks it into overdrive. (It’s my generation, cuz- without a little feedback and distortion now and them, something’s just missing for me.) I’d be happy to send you a copy, or suggest you buy one– she’s still small enough to need the income. Another was my first after-show chat with my musical idol, Pat Metheny. When I asked him why he never stretched or altered compositions or arrangements when performing with the Pat Metheny Group, he replied, “They’re the big band. They play the charts.” (Later when he cut my favorite movements out of two of his songs played live, I was deeply irritated and sorry I’d suggested anything!) It was easy to see the Group as a modern Big Band. Its core quartet are augmented by between three and five second-line musicians who multiply their own efforts with a battery of wind instruments, arrays of mallets and percussion oddities, plus guitars and vocals. It’s something to see live, as deliberate and intricate as a watching a team of top chefs working up dinner in the diner of a speeding train, to stretch a metaphor. The Group’s last effort, “The Way Up,” involved nine musicians playing over an hour with a composition that fills a 300-page music book. So yes, I like complexity, which is one thing Big Bands were good at, and something that got lost in the bebop age of minimalist bands. Pat’s next act, which should push complexity to a new level, is too compose and tour with a modern Orchestration. Check his site for details- any attempt at description of this would keep me up even later, and it’s too late now. I’d recommend you look up “The Music of Pat Metheny and Lyle Mays” by Bob Curnow and the LA Big Band. It’s a small label, hard to find, but a great project. It’s a note-for-note rearrangement into the language of a big Big Band, with over two dozen players, IIRC. These compositions are deeply grooved into my brain now, but hearing them with oboes and clarinets taking the leads was a whole new experience. It removed all the distance between me and the Big Band era, all those pencil-thin mustaches and zoot suits and dry cocktails. But I have pretty big ears. Driving through Kansas City once, I was treated to an hour’s program on Lounge music. Sandy Denny and the like. Wow, what a forgotten genre of music! I found myself digging some of it. Lots of emphasis on orchestration; not just what notes are played, but what voices play them. A good bit of world music influence, too, like I hear in Metheny’s music, who also grew up in KC, listening to this stuff, perhaps? So, Big Band strikes me when I’m out looking for something else. As for Swing, I hear that in all good jazz. If I had to find some on my shelf, I’d dig for my disc of David Grisman with Stephane Grappelli. Anything by Grisman swings like Chipper Jones at a high fast one, right?